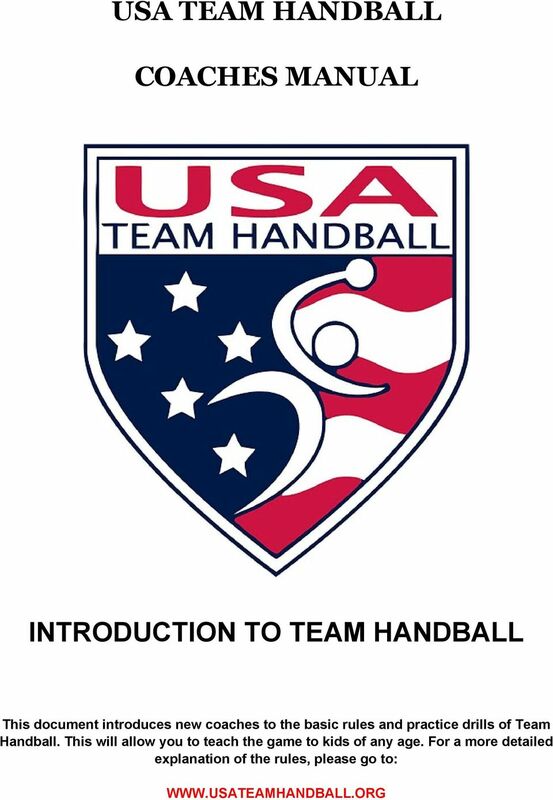 Download "INTRODUCTION TO TEAM HANDBALL"
2 Team Handball is a fast paced high-scoring Olympic sport and the second most popular team sport in Europe. Two teams of seven players compete to score the most goals. The team with the most goals after two periods of is the winner. The game consists of two 30 minute periods and a 10 minute half time. The length of the game can be adjusted for kids depending upon their age and the time available. The game is officiated by two referees. EQUIPMENT The ball is spherical and must be made of either leather or a synthetic material. It is not allowed to have a shiny or slippery surface, as it is intended to be handled with one hand. 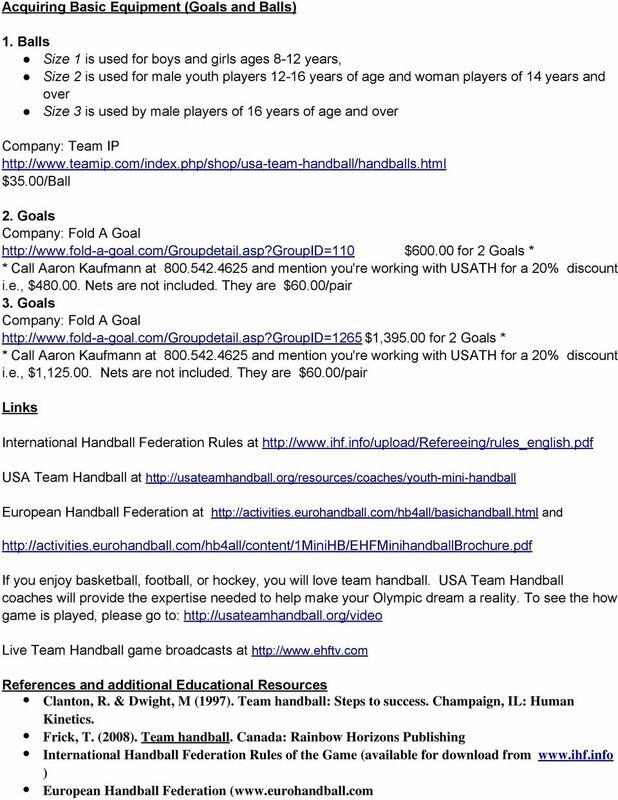 There are three sizes of handballs, below are some general guidelines on balls: Size 1 is used for boys and girls ages 8-12 years Size 2 is used for male players years of age and woman players of 14 years and over Size 3 is used by male players of 16 years of age and over The Goals are 2 meters high and 3 metres wide (6 feet 7 inches by 9 feet 10 inches) and are similar to the ones used in soccer. They are placed at the center of each end of the playing field. Other Equipment: Players may use knee and elbow pads/protectors, however no additional protective gear is allowed. More information about acquiring equipment can be found on the last page. 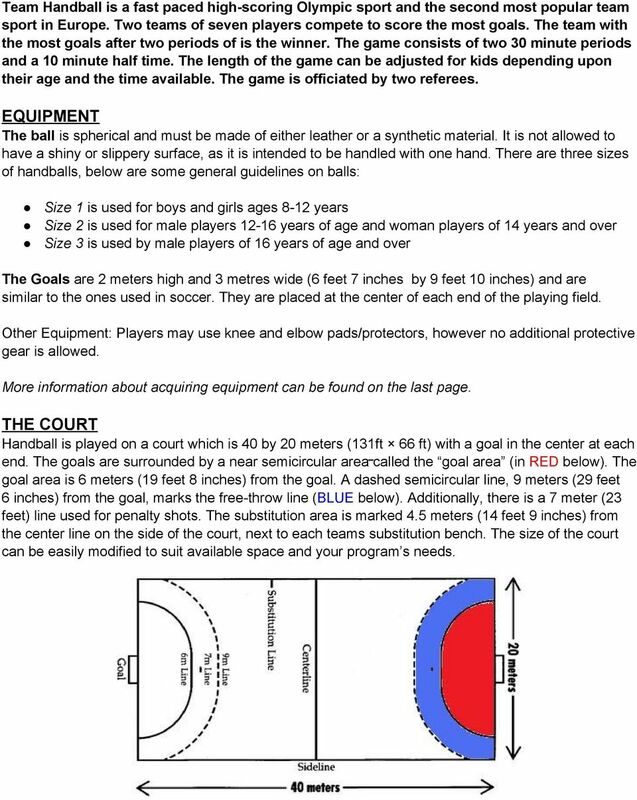 THE COURT Handball is played on a court which is 40 by 20 meters (131ft 66 ft) with a goal in the center at each end. The goals are surrounded by a near semicircular area called the goal area (in RED below). The goal area is 6 meters (19 feet 8 inches) from the goal. A dashed semicircular line, 9 meters (29 feet 6 inches) from the goal, marks the free-throw line (BLUE below). Additionally, there is a 7 meter (23 feet) line used for penalty shots. 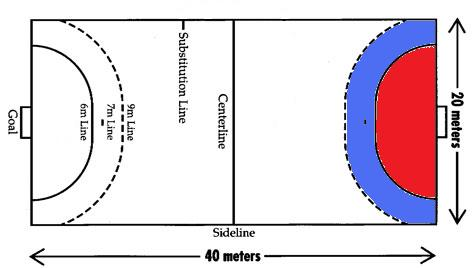 The substitution area is marked 4.5 meters (14 feet 9 inches) from the center line on the side of the court, next to each teams substitution bench. The size of the court can be easily modified to suit available space and your program s needs. 3 THE BASIC RULES: 1. No players, other than the goalkeeper, are allowed inside the goal area. Goalkeepers are allowed to handle the ball in the goal area but may not carry the ball outside the area. They are allowed to leave the area without the ball. Offensive players may land in the goal area if the ball is released before landing in the area. 2. After receiving the ball, players can hold the ball for only three seconds after which they must either pass, dribble or shoot. If they dibble, they have an additional 3 seconds after which they must either pass or shoot the ball. They are not allowed to double dribble. 3. After receiving the ball, players can take up to three steps without dribbling. If players dribble, they may take an additional three steps. Each foot movement counts as a step. Dribbling is only used to gain additional steps. 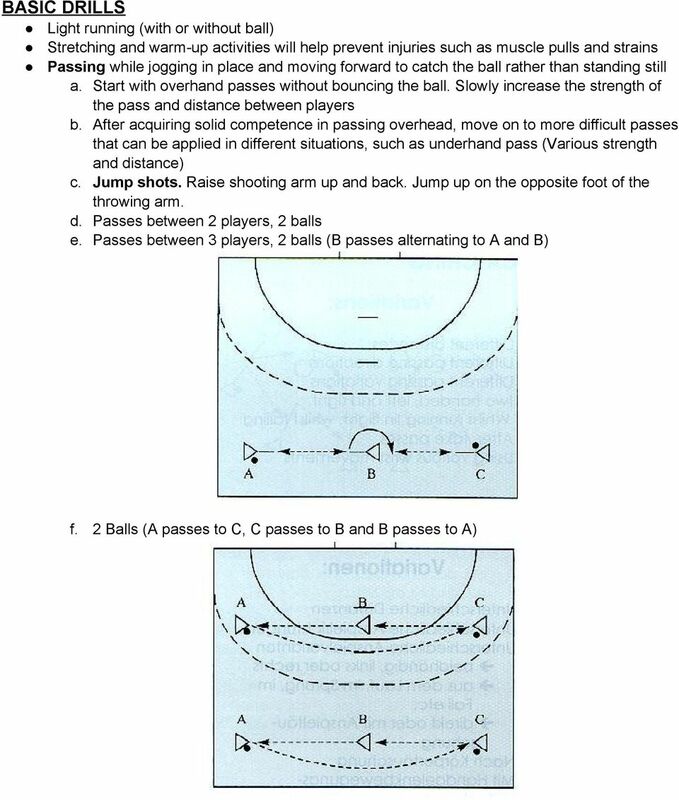 Passing the ball is the faster/better option. 4. Defensive players are allowed to use their body, arms, and hands to obstruct an opponent with or without the ball. 5. 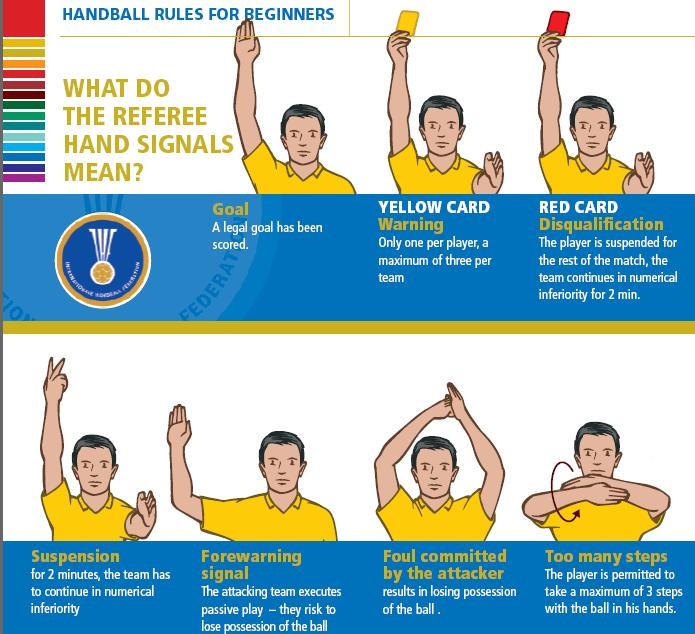 The extent and intensity of body contact is regulated by the Rules of the Game (International Handball Federation Rules) and subject to interpretation by the referees. However, hitting, tackling, pushing, clinching, tripping or reaching for the ball from behind is prohibited. 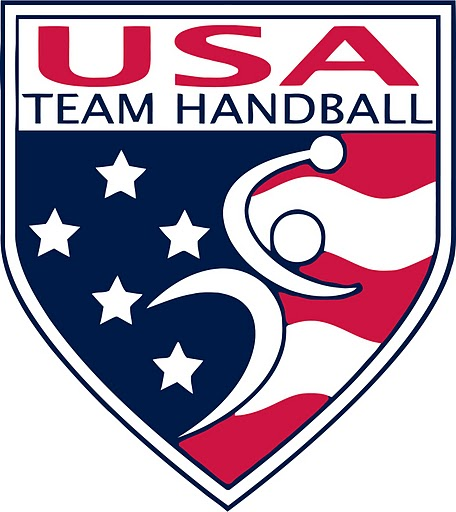 New handball players should first learn proper technique and use basketball-style, no contact defense focusing on blocking the opponent s path as well as stealing the ball rather than physical contact. 6. Handball players are allowed an unlimited number of fouls which are considered good defense and disruptive to the attacking team's rhythm. When a defender stops an attacker with their arms on the side, the play is stopped and restarted from the free-throw 9 meter line with a free throw with the attacking team in possession. 7. Both teams are allowed an unlimited number of substitutions. Teams are allowed to substitute players on the fly as long as the substituted player enters the floor after the player being replaced has exited. Incorrect substitutions are punished by a 2 minute penalty. Substitutions can only be made in the substitution area, located towards the middle of the court. 8. If the game is tied after time has expired, two 5 minute overtime periods can be played followed by another period of overtime if necessary (double overtime). If the game still remains tied, each team nominates 5 players players to shoot a 7 meter penalty shot. Alternating shots are taken until the winner is decided. 9. The game is restarted at the court middle after a goal is scored, after a signal from the referee.the opposing team has to stay at least 3 meters away from the thrower when restarting the game. 10.A throw-in is taken when the ball goes out of bounds. It is taken on the sidelines of the court with the player out of bounds with one foot on the line. A team is awarded a throw-in when a player of the opposing team touches the ball last. 11.If the defense deflects the ball out of bounds and it goes over the goal line, the ball is inbounded from the corner by the offensive team. If the ball is deflected out of bounds by the goalie and goes over the goal line, the goalie s team is awarded possession of the ball. The goalie will then put the ball in play from the goal area. 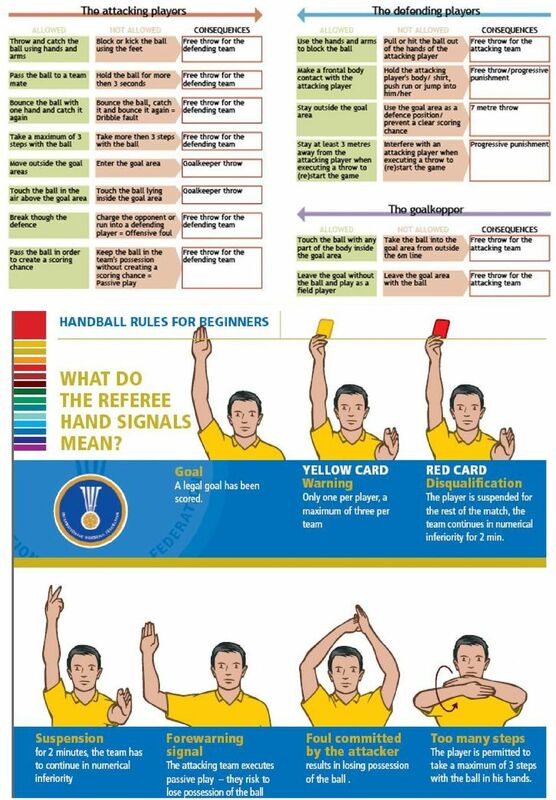 4 PENALTIES Handball uses a progressive punishment system. Actions directed at the opponent and not the ball (such as reaching around, holding, pushing, hitting, tripping, or jumping into opponent) as well as contact from the side or from behind a player are all considered illegal and subject to various penalties.the penalties get progressively severe. 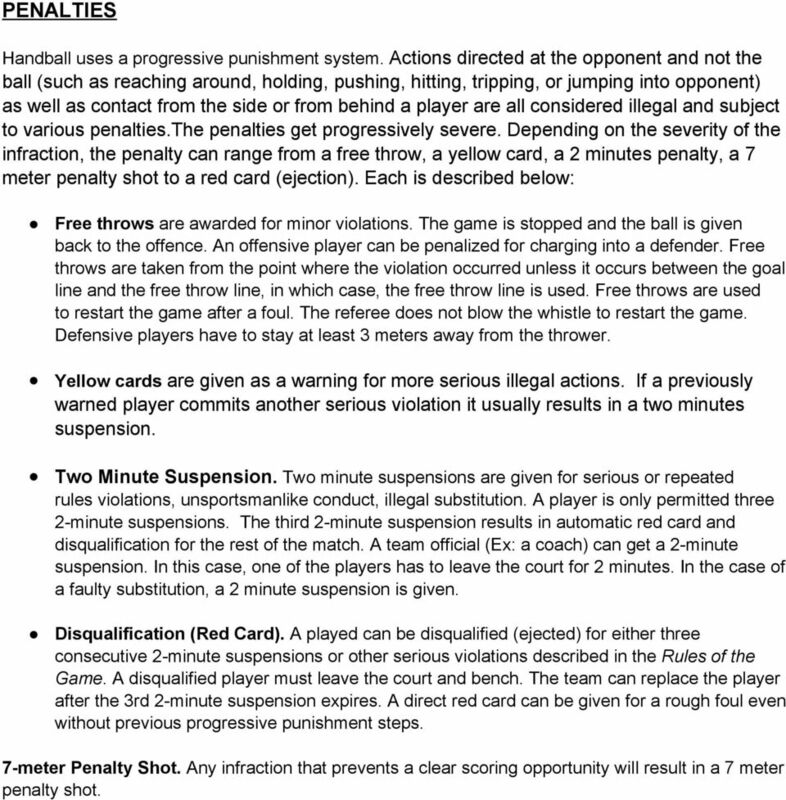 Depending on the severity of the infraction, the penalty can range from a free throw, a yellow card, a 2 minutes penalty, a 7 meter penalty shot to a red card (ejection). 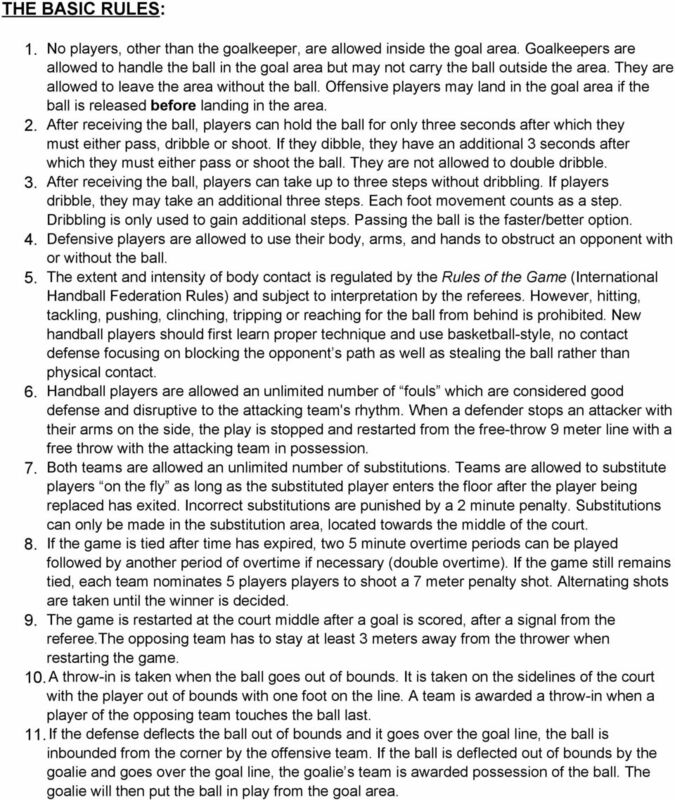 Each is described below: Free throws are awarded for minor violations. The game is stopped and the ball is given back to the offence. An offensive player can be penalized for charging into a defender. Free throws are taken from the point where the violation occurred unless it occurs between the goal line and the free throw line, in which case, the free throw line is used. Free throws are used to restart the game after a foul. The referee does not blow the whistle to restart the game. Defensive players have to stay at least 3 meters away from the thrower. Yellow cards are given as a warning for more serious illegal actions. If a previously warned player commits another serious violation it usually results in a two minutes suspension. Two Minute Suspension. Two minute suspensions are given for serious or repeated rules violations, unsportsmanlike conduct, illegal substitution. A player is only permitted three 2-minute suspensions. The third 2-minute suspension results in automatic red card and disqualification for the rest of the match. A team official (Ex: a coach) can get a 2-minute suspension. In this case, one of the players has to leave the court for 2 minutes. 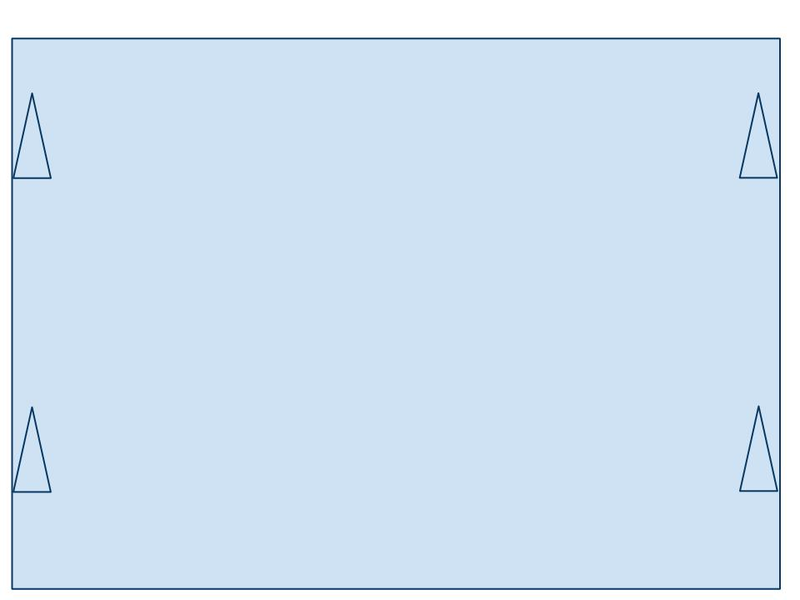 In the case of a faulty substitution, a 2 minute suspension is given. Disqualification (Red Card). A played can be disqualified (ejected) for either three consecutive 2-minute suspensions or other serious violations described in the Rules of the Game. A disqualified player must leave the court and bench. The team can replace the player after the 3rd 2-minute suspension expires. A direct red card can be given for a rough foul even without previous progressive punishment steps. 7-meter Penalty Shot. 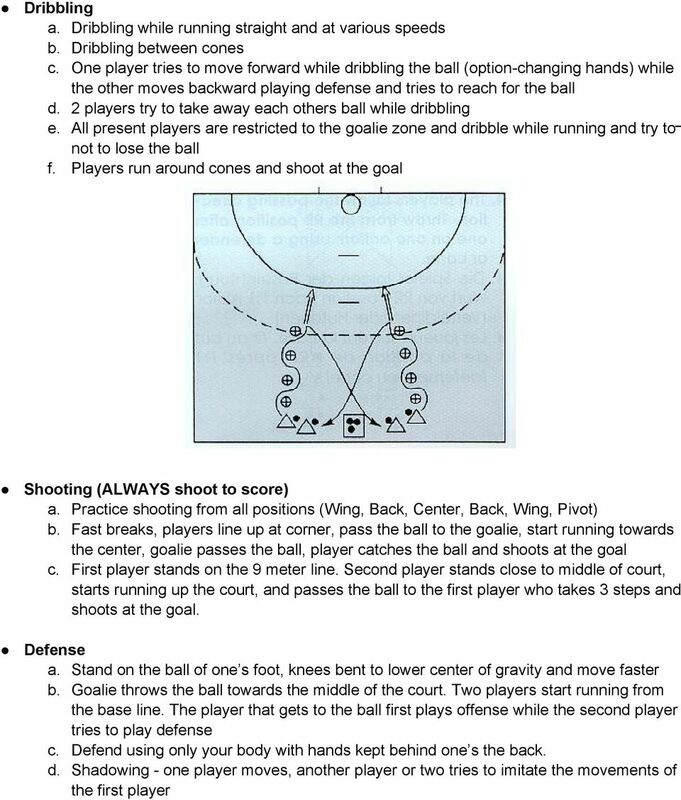 Any infraction that prevents a clear scoring opportunity will result in a 7 meter penalty shot. 6 THE POSITIONS Each team has a maximum roster of 16 players but only 7 players can be on the court during play. Basic offense Goalie Only player allowed to move freely in the goal area. Can step outside the goalie zone but cannot do so while dribbling or holding the ball. Only player allowed to touch the ball with all body parts while in the goal area. If the goalie deflects the ball behind the goal line, the goalie gets to throw the ball back into the game. If a defending player defects the ball over the goal line, the opposing team gets the ball. Throwing the ball at goalkeeper s head while he is not moving is punished by disqualification (red card). Left and Right Wing Typically excel at ball control and wide jumps from the outside of the goal perimeter to get a better shooting angle at the goal. Teams usually try to occupy the left wing position with a right-handed player and vice verse. These players are usually fast and able to run fast-breaks (counter-attacks) for the team. Left and Right Back Usually tall and able to jump high. Goal attempts by these players are typically made by jumping high and shooting over the defenders as well as by breaking-through in 1-on-1 situations. Center Back A player with experience is preferred on this position. He/she acts as a primary play-maker. Circle (Pivot) Interferes with the opposing defense to create opportunities for the team by disrupting the defense or setting picks. Least jumping skills required but ball control and physical strength are advantages. 7 THE BASIC DEFENSE The main objectives of all defensive actions are to prevent opposing team from scoring a goal and win the ball back to initiate the counter-attack. There are three basic defensive systems in handball: man-to man, zone, and combination defenses. 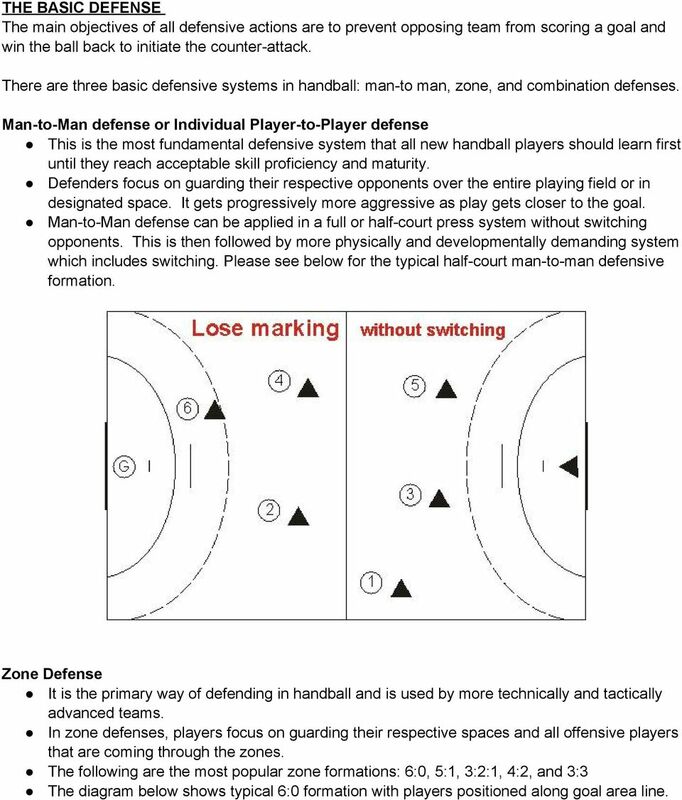 Man-to-Man defense or Individual Player-to-Player defense This is the most fundamental defensive system that all new handball players should learn first until they reach acceptable skill proficiency and maturity. Defenders focus on guarding their respective opponents over the entire playing field or in designated space. It gets progressively more aggressive as play gets closer to the goal. Man-to-Man defense can be applied in a full or half-court press system without switching opponents. This is then followed by more physically and developmentally demanding system which includes switching. Please see below for the typical half-court man-to-man defensive formation. 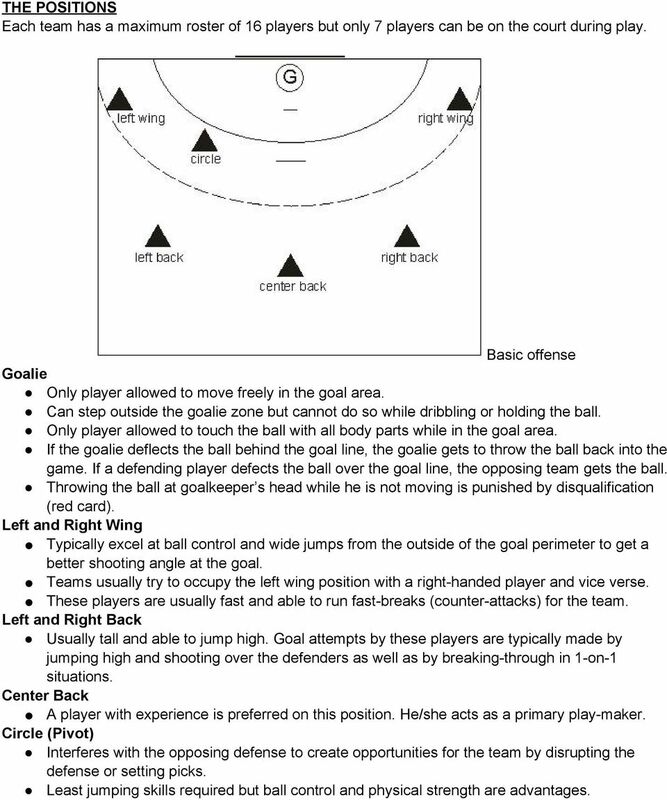 Zone Defense It is the primary way of defending in handball and is used by more technically and tactically advanced teams. In zone defenses, players focus on guarding their respective spaces and all offensive players that are coming through the zones. The following are the most popular zone formations: 6:0, 5:1, 3:2:1, 4:2, and 3:3 The diagram below shows typical 6:0 formation with players positioned along goal area line. 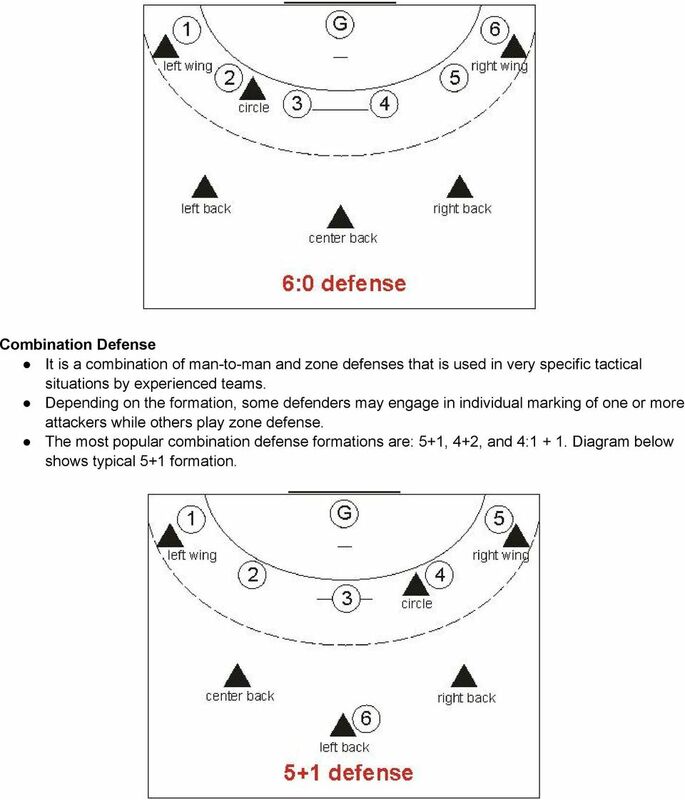 8 Combination Defense It is a combination of man-to-man and zone defenses that is used in very specific tactical situations by experienced teams. Depending on the formation, some defenders may engage in individual marking of one or more attackers while others play zone defense. 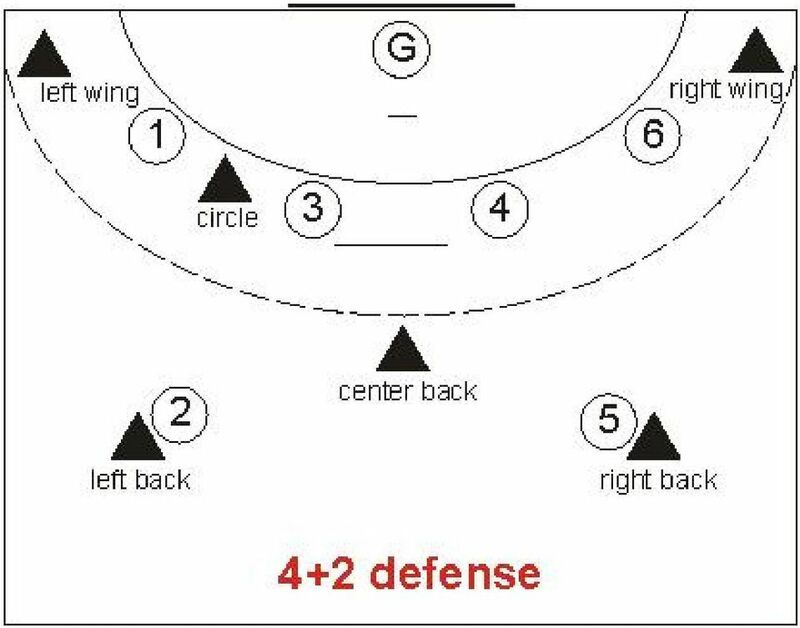 The most popular combination defense formations are: 5+1, 4+2, and 4: Diagram below shows typical 5+1 formation. 12 SAMPLE GAMES Games encourage participation and positive experience while teaching valuable skills. Catch & Rescue Bridges (for younger kids) One player tries to tag as many other players as possible Once a player is tagged he/she makes a bridge on all fours. He/she is rescued when another player crawls under the bridge i.e., under the player Game is over when all players have been tagged War of Balls (Throwing/catching drill) Continuous passing in groups of three in a circle. If someone in the group drops the ball then that team is eliminated. They are not allowed to hold the ball for longer than three seconds.the last group not dropping the ball wins. 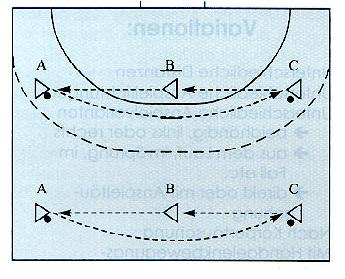 If none of the groups drop the ball while standing, then have them start moving through the gym, walking first, then running For added difficulty have one player distract the group. 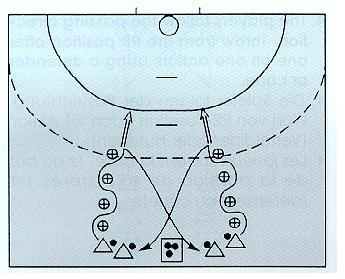 The player can only reach for the flying ball If the group is somewhat advanced, then 2 balls per 3 players can be used. 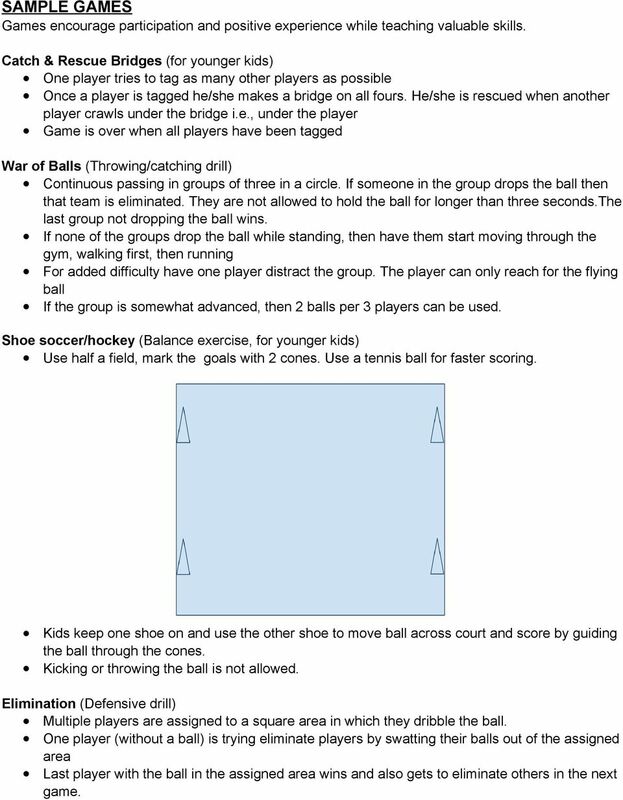 Shoe soccer/hockey (Balance exercise, for younger kids) Use half a field, mark the goals with 2 cones. Use a tennis ball for faster scoring. Kids keep one shoe on and use the other shoe to move ball across court and score by guiding the ball through the cones. Kicking or throwing the ball is not allowed. Elimination (Defensive drill) Multiple players are assigned to a square area in which they dribble the ball. 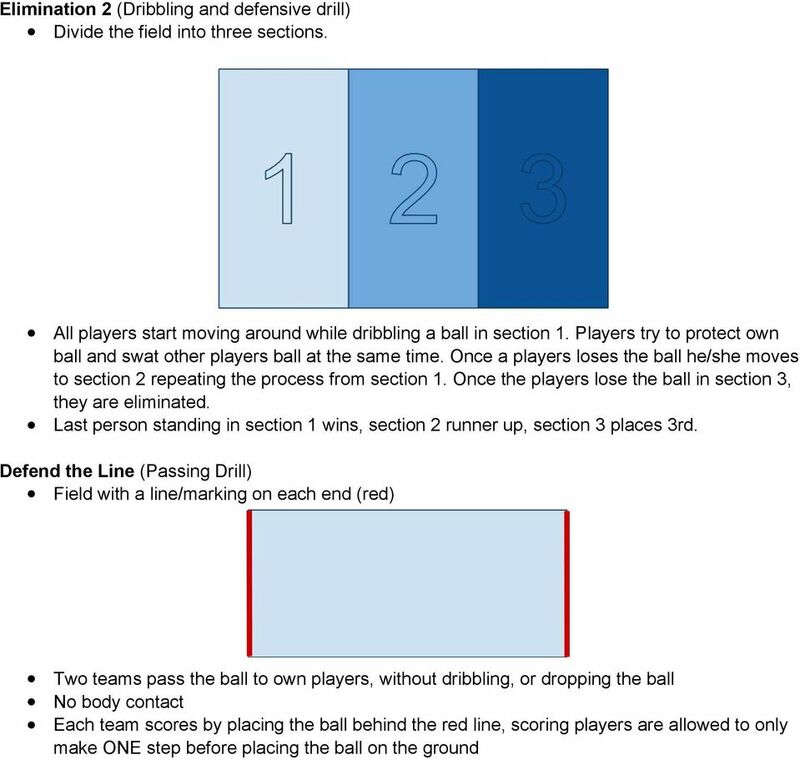 One player (without a ball) is trying eliminate players by swatting their balls out of the assigned area Last player with the ball in the assigned area wins and also gets to eliminate others in the next game. 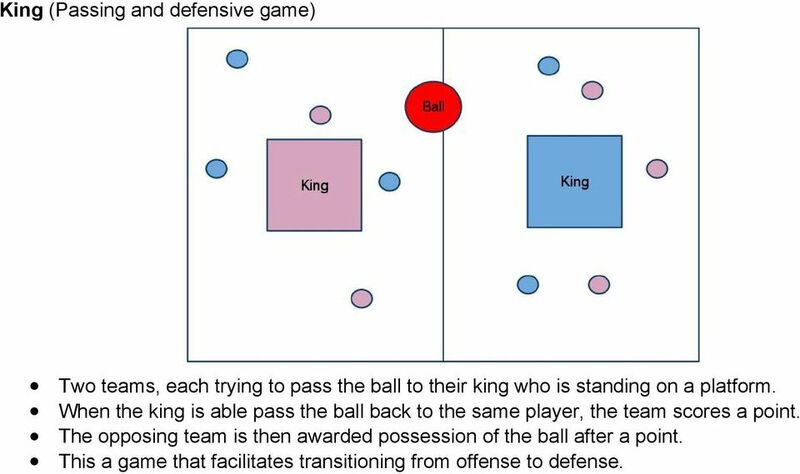 15 King (Passing and defensive game) Two teams, each trying to pass the ball to their king who is standing on a platform. When the king is able pass the ball back to the same player, the team scores a point. The opposing team is then awarded possession of the ball after a point. 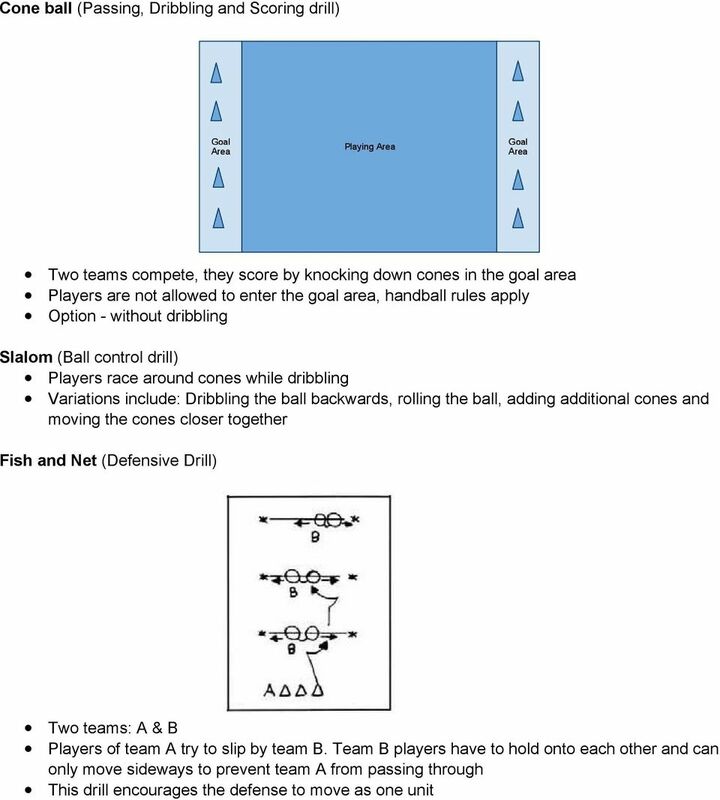 This a game that facilitates transitioning from offense to defense.